Chevening Scholars were invited to the Foreign and Commonwealth Office (FCO) to discuss issues of education and development with the FCO’s Special Envoy for Gender Equality, Joanna Roper, and the Kenyan Cabinet Secretary for Education, Amina Mohamed. This roundtable meeting came as the UK Foreign Secretary Boris Johnson made the case for global leaders to commit to educating the world’s most marginalised girls. 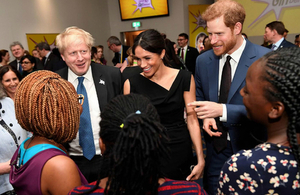 He pledged that Britain would provide both political and financial leadership to ensure that girls across the Commonwealth receive 12 years of quality education by 2030. Chevening and Commonwealth Scholars from Kenya earlier met with Amina Mohamed and Joanna Roper to discuss issues of education, with a special focus on education in Kenya. Alphonce Shiundu, a Kenyan scholar studying at the University of Westminster, acknowledged that the roundtable presented a unique opportunity to probe into the challenges currently facing Kenya’s education system, to ask difficult questions, but also to understand senior policymakers’ view on these challenges and the opportunities that they give rise to, including the potential to partner with the UK in areas of mutual benefit. John Mukabi Njeri, studying International Development at the University of Manchester, explained that topics of conversation ranged from academic staff development, Kenya’s ‘free education’ policy, technical and vocational training for young people, and education’s role in supporting Kenya’s development ambitions. Amina Mohamed spoke frankly with scholars about the challenges she faces in her role as education secretary. She reminded them of their responsibility to return to Kenya in order to use the knowledge and networks gained in the UK to help solve some of Kenya’s development challenges, which aligns with Chevening's aim of developing future leaders who will return home to bring positive change to their communities, sectors, and countries.